According to WhatIs.com, The Internet of Things (IoT) is a system of interrelated computing devices, mechanical and digital machines, objects, animals or people that are provided with unique identifiers and the ability to transfer data over a network without requiring human-to-human or human-to-computer interaction. For the office products and supplies industry, the connectivity between printing devices and the internet is facilitated by deploying a "Data Collection Agent" on a customer's network for the purposes of identifying and monitoring all the printers and copiers connected to that network. In doing so, the printer hardware becomes part of the Internet of Things. 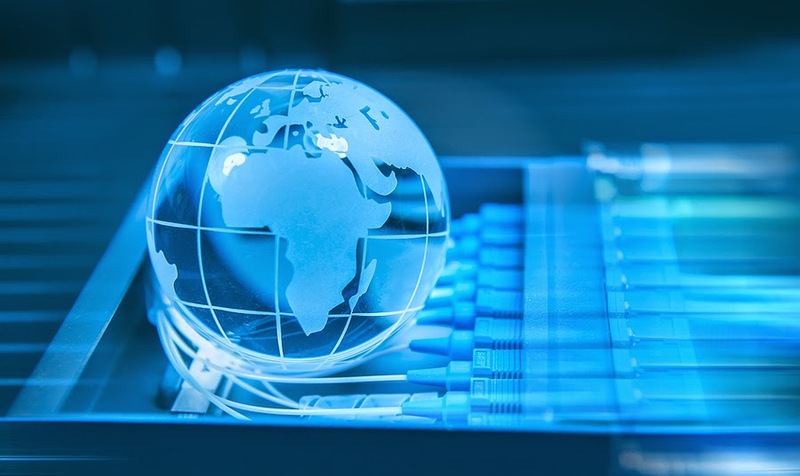 The copier channel (BTA) has already connected a large portion of their customer's hardware to the Internet through the implementation of managed print services (MPS). As a result, many US businesses with 50+ printers have been converted to multi-year managed print contracts. However, the selling cycle for MPS is significantly longer than that of a transactional sale and the selling skills for negotiating multi-year MPS contracts are very different to those typically held by a transactional salesperson. Usually, a successful transactional salesperson does not convert well to become a successful service-selling salesperson with offerings such as MPS. Preparing and closing a contract for MPS takes time - without a multi-year contract the cost of customer acquisition and the life-time-value of the customer are out of balance - it's a money losing proposition. It's often stated that a business with less than 50 printers is not worth considering for a managed print contract. If that's true, then there's a large number of small to medium size businesses that remain outside contracted commitments and remain an opportunity for a more suitable alternative. That alternative needs to be tailored to the selling skills of the office products transactional salesperson, while also providing an improved value proposition for the customer. Is the market for Managed Print Services saturated and, if so, what's the opportunity for a traditional office supplies reseller in the transactional space? In the profile of U.S. office printer hardware distribution as presented in the table above, there are estimated to be over 40 million printing devices operating outside of managed print service agreements. This is 80% of the total number of office printing devices. Assuming the same number of average pages printed, regardless of where the device fits in the market segmentation, this means 80% of the $25 billion annual retail spend on ink and toner cartridges is not contracted to long-term managed print service agreements. Therefore, although managed print contracts may put some attractive accounts out-of-the-reach of traditional office products resellers, there's still around 80% of the market to target. Unequivocally, the overall market is not saturated with managed print contracts, although the market for businesses with greater than 50 printing devices may be. The opportunity to reduce customer churn should be a big incentive for transactional resellers to get their customer's hardware connected to the IoT, without them having to resort to offering unsuitable, multi-year managed print contracts. Mapping specific printer devices to specific cartridge styles becomes possible when the printer is connected to the IoT. The CEO wants an OEM brand cartridge but the warehouse printer is OK with an off-brand compatible - no problem! Let's take a look at our Return on Investment calculator. 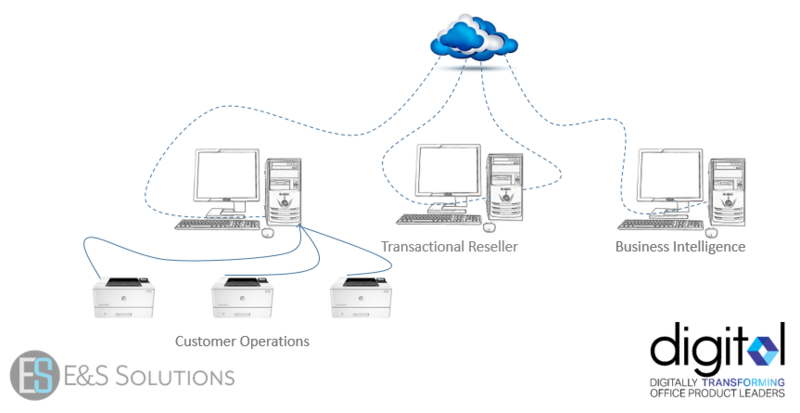 It represents two Office Supplies Reseller scenarios. Dealer A (With DCA) has deployed the Data Collection Agent and Dealer B (No DCA) has not. 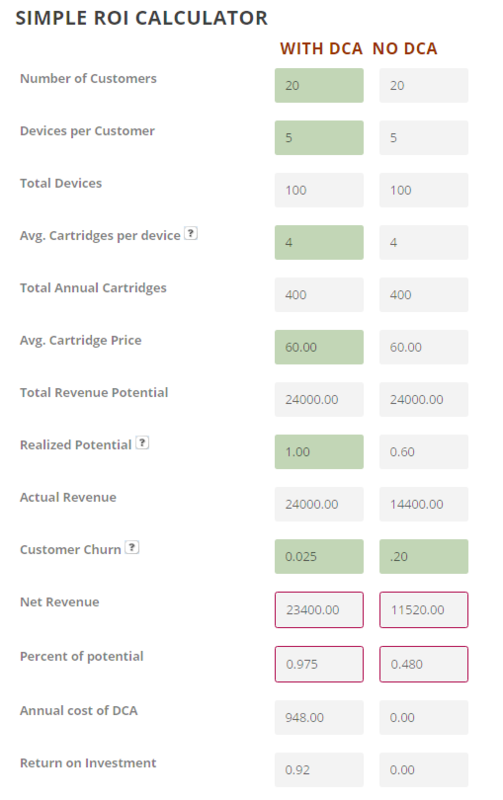 The underlying assumptions are 20 customers each with an average of 5 printers using an average of 4 cartridges per device per year and an average cartridge sell price from the reseller to the customer of $60. For Dealer A, that's a total revenue potential of $24,000 per year. But, for Dealer B, only aware of 60% of the printing hardware devices at the 20 customers, the revenue potential is only $14,400! Dealer A has a big advantage over Dealer B as he starts to leverage Big Data to transform his business. Dealer A now has access to information that puts him ahead of the curve. Not only does he know every printing device on the customer's network, he also knows when every cartridge is going to run out, while Dealer B has access to none of this business intelligence. By knowing when the cartridges are going to run out, Dealer A is in a superior position for obtaining repeat orders and is able to reduce customer churn rates from 20% to 2.5%. Dealer A is able to realize 97.5% of the revenue potential from his 20 customers while Dealer B is only able to realize 48%. Dealer A generates twice the sales revenue ($23,400) of Dealer B ($11,520) and has a huge customer retention advantage. You can see Reseller A incurs a cost to monitor its customer's printer hardware. In our example of 20 customers and an aggregate total of 100 printing devices, that cost is around $950 per year. However, these monitoring costs are clearly a worthwhile investment as the returns are over 90% within a 12-month time-frame. The benefit to the reseller should be very clear. But, for this service to be a viable proposition to a resellers customers, there has to be a benefit to those customers that motivates them to allow the Data Collection Agent on be installed on their network. We've only presented the advantages to a reseller in terms of realizing revenue potential and reducing churn with existing customers. Think for a moment about the possibilities for improving customer acquisition rates by using the data gathered by the DCA to populate proposals and leveraging access to big data. One of the biggest issues facing resellers is the conversion process from OEM brands to aftermarket brands. Think about that conversion process - perhaps leveraging access to data in the office products industry to access brands with high levels of trust and recognition such as Xerox, IBM, and Kodak, can be utilized to demonstrate to the 80% of consumers still using OEM products, a trustworthy path to transitioning toward money-saving aftermarket products! In building customer confidence and demonstrating a variety of value propositions, the reseller can leverage technology to save customers money. How many customers bother to manage their printing device assets? How many know what they have, how old they are and what their total cost of ownership is? How often do they ignore the ink or toner "low" messages and suddenly find they've run out, and have to make an emergency trip to their local superstore, paying full retail prices, usually on over-priced OEM brand cartridge? Worse still, how many see the "toner low" warning and immediately install a new cartridge not knowing there may have been as much as 20% of the original supply remaining? All of these potential issues can be eliminated after installing the DCA on a network, the hardware assets are identified, the usage patterns are established, the reorder points are determined. Last minute panics are eliminated. The buyer's time in the process is significantly reduced. Mapping the best value proposition to each printer based on print volumes and print requirements become routine, with information technology controlling the flow of cartridges to each device as and when they're needed. Customer printing costs are reduced and employees time can be spent in more productive areas. The internet of things is here to stay. By 2020, 4 billion connected people, 25+ million apps, 25+ billion embedded and intelligent systems, 50 trillion gigabytes of data and a $4 trillion revenue opportunity. It's not going away - it's high time to get aboard and participate. Check out our free eBook with a comprehensive assessment of the office products industry and the opportunities to develop significant sales growth in a challenging industry.